Niihama (新居浜市, Niihama-shi) is a city located in the eastern part of Ehime Prefecture, Japan. It has the third largest population in Ehime, behind the prefectural capital of Matsuyama and the recently expanded city of Imabari. On August 31,2016, the city has an estimated population of 121,758 and a population density of 519.67 persons per km². The total area is 234.30 km². Niihama was founded on November 3, 1937. It is famous for its Besshi copper mine as well as the annual Niihama Taiko Festival (also known as "The Man Festival", otokomatsuri 男祭り) that is the center of annual drunken and boisterous activity, drawing tourists from around the country to watch this festival. Niihama is known for its local dialect, Niihama-ben. Niihama is positioned in the north-center area of Shikoku, in the eastern part of Ehime Prefecture. Niihama is enveloped by mountains to the south and east, hills to the west, and the Seto Inland Sea to the north. The Kokuryo River flows from the mountains to the Seto Inland Sea and divides the city into an areas east of the river (kawahigashi) and west of the river (kawanishi). Being surrounded by mountains, Niihama feels geographically isolated from its closest neighbors, Saijō to the west and Shikokuchūō to the east. The border with Kōchi Prefecture lies in the mountains far south of the center of town. The island of Ōshima, northeast of the main part of the city, also is part of Niihama. The largely mountainous village of Besshi joined the city of Niihama in 2003 greatly increasing the size of the city. The Besshi copper mine (once considered to be one of the most productive in the world) jump-started the Sumitomo corporation. Even though the mine has since closed (its legacy is now preserved in a small museum and onsen attraction, Minetopia Besshi), Sumitomo remains a large presence in town. 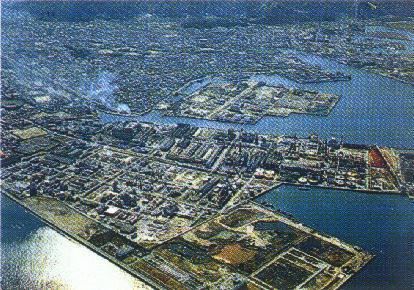 The economy of Niihama is supported largely by factories as well as activities at its ports. The Yosan Line of Shikoku Railway Company (JR Shikoku) runs through Niihama. Highways and local roads connect Niihama to the rest of the island. On the highway, Matsuyama is under an hour away, and the other main cities of Shikoku (Takamatsu, Kōchi, and Tokushima) are all just over an hour's drive away. The Niihama National College of Technology is a technology college in Niihama. The Niihama Taiko Festival is a harvest festival held over 16–18 October each year. Each of 50 neighborhoods in Niihama has its own Taiko float, which consists of an ornately decorated wooden center frame, covered in panels made of gold thread (three to a side). The column is covered with a fabric top (usually red and white), which symbolically represents the sun; it is surrounded by long black cushions folded into a figure of 8 with hanging tassels, representing the clouds and rain. 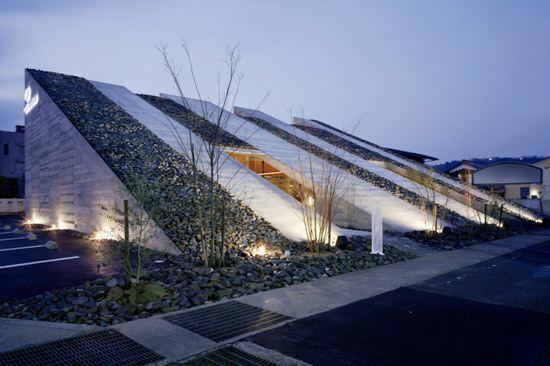 The design is intended to show gratitude for a good harvest. Gold dragons adorn the top panels of the float while the lower panels show traditional buildings, animals or legends. Inside the float, a drummer beats a deep booming taiko drum, providing the rhythm that guides 150 men below, who carry the float by four long wooden beams at the float's base. Four crew members stand on the beams and control the rest of the crew with flags, whistles and chants while four more are perched precariously on the top some 5.4 m above ground. The floats weigh over two and a half tons and can cost over $100,000US to build (collected by donations within the local area). Men and boys as young as 16 begin the festival before sunrise on its first day by carrying the floats to their local shrine for a blessing by shinto priests. The most spectacular of these happens at Utsunomiya Jinja near Yamane Ground where several floats are carried up many steps at about 4am to a small shrine on the top of a hill. For three days straight (October 16–18), 12 to 14 hours per day, they carry the floats in parades all over the city and park them for display, drinking copious amounts of sake. Sake bottlers even release commemorative bottles with labels featuring pictures of various float-carrying teams. The main events include a display of the Taiko floats in Yamane Park, Takihama Station, Kasenjiki Park, Shinto shrines across the city and at several Supermarket and shopping complexes (Jusco, Fuji Grand, M2, Co-op). On alternate years there is the spectacle of eight taikodai (floats) being loaded onto barges to travel to another location by sea. The Taiko-carrying teams are known to start fights, in which two teams ram their floats into each other until one or both floats are destroyed. Zuiō-ji is a Sōtō Zen temple at the edge of the mountains in south Niihama. It welcomes foreign visitors to participate in a Sunday morning Zazen meditation session, or even to stay overnight. It is the largest Buddhist temple in Niihama. The mountainous area between Niihama and the village of Besshi includes two major waterfalls: Chōshi no Taki and Mato no Taki (Waterfall at the Demon's Door). Niihama is home to the national headquarters of the Otedama no Kai (お手玉の会, Traditional Japanese Juggling Association). Niihama was home to the world's largest planetarium until the renovation of the Nagoya City Science Museum in March 2011.